Floating hoverboards, colonization of Mars, robots that do your homework — many of the technological advancements that we were promised over the last few decades have yet to be developed. But here at backyard-hockey.com, we’re rolling out amazing new technology right on schedule. OK, so we’re upgrading from the 1995 excel-based technology we used in our old rink calculator post to the 2005 technology we’re using below. But hey, an improvement is an improvement, right? 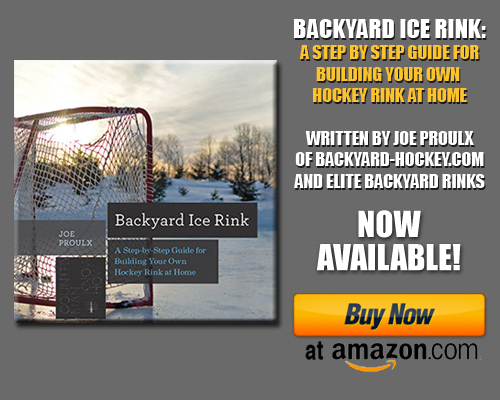 What you’ll find below are two calculators that will help you determine your minimum liner size, gauge water volume needs as you fill and maintain your rink, as well as one that will also help you time your initial fill. All four are very important, particularly as you feel your way through your first season. It should be noted that all calculations are estimates only, as it’s impossible to account for slight variations in your terrain, slope, water flow rate, or the output of your resurfacer. Have a suggestion for a new calculator, or comments on the ones below? Give us a shout. What size liner should I get? Note: This calculator takes into your account your rink width, rink length, and board height and tells you the minimum liner size you should purchase. If your board height varies, enter in your tallest measurement. It’s never a bad thing to have too much liner, but it can be season-ending if you go to fill and you don’t have enough. The calc below is the minimum size you should order. Note: This is a rough estimate of how many gallons of water you’ll need to resurface your rink. A water layer thickness of 1/8″ (or 0.125″) is common when using a homeboni. How long will it take to fill my rink? Note: If you want to use this calc, you’ll need to know how fast your hose pumps out water, which is measured in gallons-per-minute (or GPM). To determine this, grab a 5-gallon bucket, your hose, and a stopwatch, and time how many seconds it takes to fill the bucket. Divide 300 by the number of seconds it took, which will give you your hose’s flow rate. (For example, if it took you 45 seconds to fill the 5-gallon bucket, your calculation would be: 300/45 = 6.67 gallons-per-minute.) You can then enter your GPM calculation into the calculation below. Hope you found these calcs useful. Looking for more advice? Check us out on the Backyard-Hockey.com Forums! How come your liner measures ,on your calculator page ,for a 24×40 rink are different than on other places on your site. One area says 30×50 liner is enough, while your calculator page says I need 50×70? Which should I follow? My rink will be 24×40 with 18 inch boards around? Hi Scott – the calculation above gives you a minimum liner size of 29×45. For our “build a rink for $250” post, Elite Rinks suggests a liner sized 32×45 for the same size rink you mention (with 1′ tall boards). Where are you seeing 50×70? Make sure for the board height you use “1.5”, since the measurement needs to be in feet. Thanks a ton. My error was exactly that. All square! Thank you for the info. Liner question; to preserve the grass, do you recommend white liner or clear? I’ve never noticed a difference – both have worked for me. That said, I use Nicerink white these days. As long as you stay away from blue or green or black, you’re good. Feel free to join the forums…lots of experience over there that can help answer your questions if I can’t get to it. Last week it was almost frozen then we got warm temp and a lot of rain. 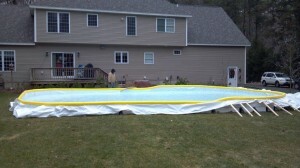 Can I except the water in the rink to freeze as good as it was when i built it or do i need to change it up. Hi Joe. I’m a bit confused on your liner size calculation. I have a 21’x33′ rink and installed a 32’x40′ tarp. My boards vary in height from 8″ to 2′ (pretty much a 50/50 split along the length of the rink in terms of the two board heights). I took the average of the two board heights (16″) and it tells me I need a 55’x67′ tarp. I guess if you want to roll up the ends behind the boards for any extra room, however I would think the recommended size would be too big. My mistake, the board height dimension input is in feet not inches, I entered in inches. Sorry!